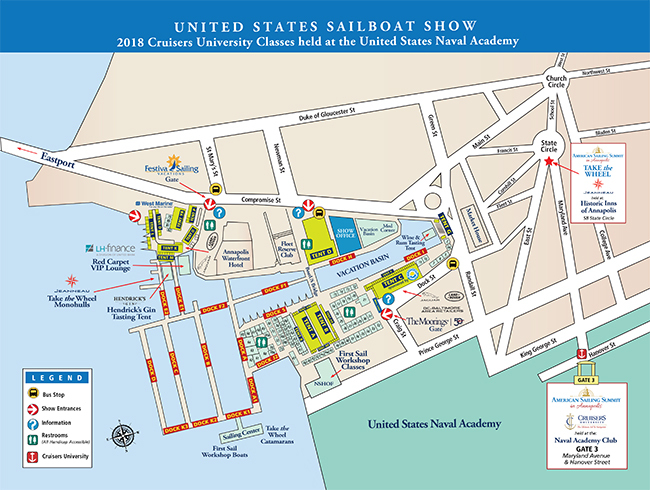 2013 Boat Show Preview • The fall and winter boat show season is on the horizon and with that comes excitement from not only boat builders, but boat buyers as well. As always, BWS is happy to give you a rundown on what to expect as you tour this year’s shows. 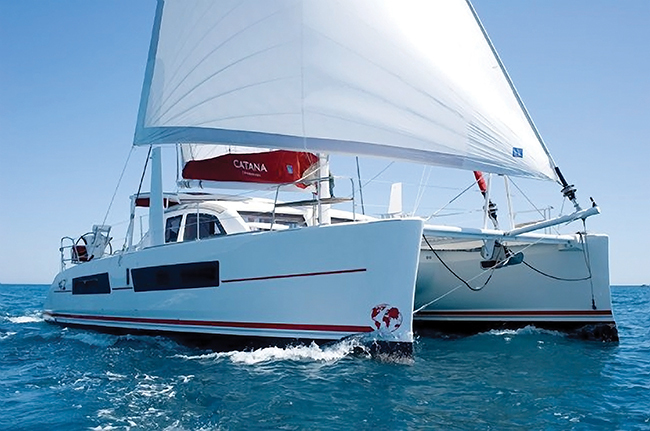 For a preview of the newest multihulls, see the August 2013 issue of Multihulls Quarterly. This year’s crop of new boats on the boat show landscape seems to be dominated by a central theme combining equal parts performance and comfort. In that regard boat designers and builders are meeting the demands of modern boat buyers by producing comfortable yet innovative yachts that also sail to an unprecedented performance standard. That means you’ll see plenty of designs with plumb bows and sterns that maximize water length for speed and offer massive living spaces down below; rigs that are easy to use yet powerful in all wind conditions; and builders offering a plethora of ways to customize a boat for your specific needs. Here are 19 boat builders that will grab your attention as you walk the docks. Bavaria Yachts will be at this year’s shows in full force with their new Vision 42 and their line of Cruiser Series boats, which range from 33 to 56 feet. Following close on the success of the Vision 46, the Vision 42 is a boat for cruisers, by cruisers. Bavaria began the Vision design by consulting cruisers from around the world to find out what they wanted in a boat. Along with British Boutique firm, Design Unlimited, Farr Yacht Design took over from there and what they’ve come up with is a cruiser that will make fast passages and be a comfortable live aboard as well. The two-cabin layout is available with one or two heads and the owner can customize all of the wood and upholstery. For more info visit www.bavariayachts.com. Beneteau always shows up with an impressive line of boats and this year will be no different. 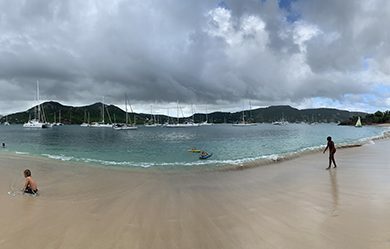 They will be debuting their new Oceanis 38 and will have a stable of other models including the Oceanis 34 to 55 and their popular Sense models. 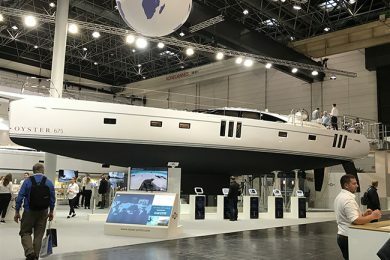 The much-anticipated Oceanis 38 will be debuting at all the major shows this fall and the buzz centers around the boat’s three unique layout options and adaptability. Available as a Daysailer, Weekender or Cruiser, the 38’s interior and exterior layouts can be suited for any sailor’s needs as owners are able to add or remove design elements as they see fit. For more information visit www.beneteauusa.com. The Blue Jacket 40 will be making its fall boat show debut this year with much fanfare. Designed by Tim Jackett, formerly of C&C and Tartan, and Island Packet’s founder and chief designer, Bob Johnson, the new Blue Jacket 40 has already garnered much attention in its relatively short lifespan. 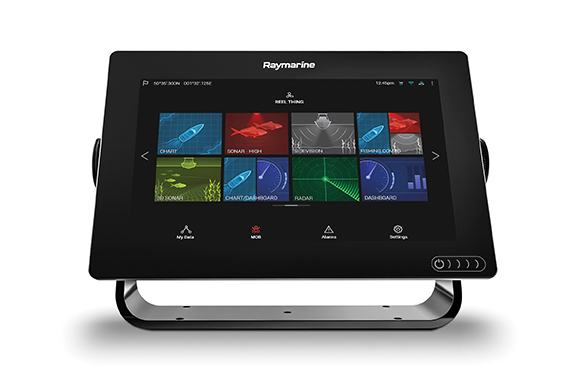 As you can imagine, the boat’s unique design offers elements of the IP line, but with a performance twist. 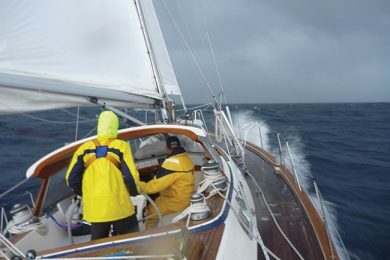 BWS had a chance to sail hull number two in Florida and to say we came away impressed would be an understatement (for the full review see BWS, Nov. 2012). This quality performance cruiser will be an excellent choice for a couple or small family and is definitely worth a look. For more information visit www.bluejacketyachts.com. Fun, and fast, the C&C 101 will be making an appearance at this years shows and for those who think the boat is a purpose-built racer, guess again. Sure, at first glance from the dock the 101 may seem like a pure racer but it will make for a great daysailer and has enough interior space and amenities to make for an able weekender as well. Built as a racer/cruiser the 101 is a perfect balance of both worlds. With a carbon fiber rig and large asymmetrical chute tacked to an extending bowsprit the boat will surely get you where you want to go quickly. Once there though, a comfortable interior with a two-burner stove, proper marine head and room to sleep the whole crew won’t make you feel as though you are camping out. For more information visit www.c-cyachts.com. It is always interesting to see what Catalina is up to and this year they will be debuting their new 275 Sport at the Annapolis boat show and bringing along a host of cruising boats from 31 to 44 feet. The 275 Sport (see BWS’ design review in the August 2013 issue) is a uniquely designed pocket cruiser with a bit of a performance edge. Designed by Catalina’s Gerry Douglas, the 275 was conceived to be simple to maintain and fun to cruise while also being capable of racing around the buoys. 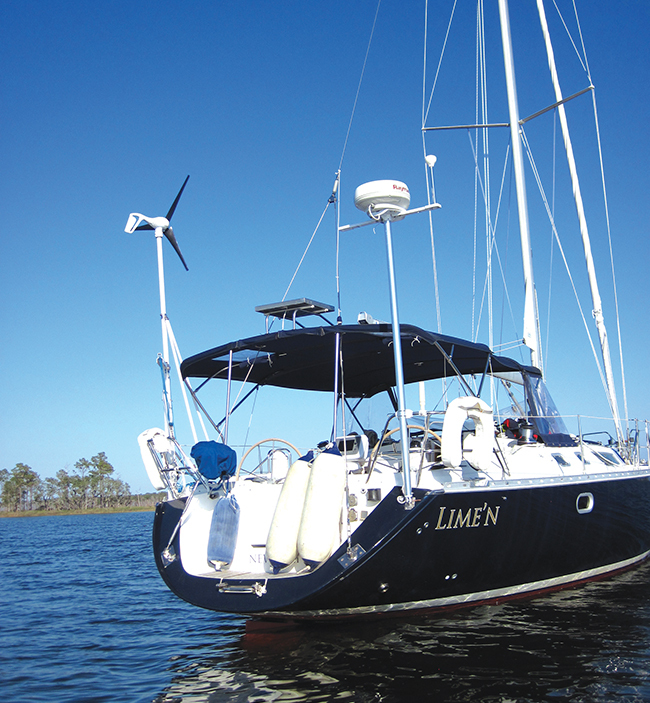 This may be the perfect boat for newer sailors or those looking to move down a size. From there, Catalina’s cruising range will excite with the popular 315 that debuted 18 months ago, up to their Ocean series 385 and award winning 445. 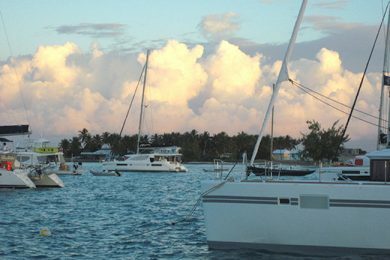 For more information visit www.catalinayachts.com. This sporty, European-styled cruiser by Dehler Yachts will certainly turn heads come boat show time. The 38 Competition is a true performance cruiser that would be fun on charter, as a full-time cruiser or as a family racer. Designed by Judel/Vrolijk & Co the 38 has dual carbon fiber helms with a full, cockpit length traveler just forward to allow for easy trimming and shaping of the mainsail. The boat has a near plumb bow and stern with a fold down transom to effectively maximize waterline length and boat speed. Down below is a standard three-cabin layout with galley to starboard and head to port. If a performance cruiser is what you are after this fall, take a look at the new Dehler 38 Competition. For more information visit www.dehler.com. Dufour will be on hand this fall as well with their Grand Large and Performance series yachts. The sleek Performance series, including the 40e and 45e, are performance cruisers that have a racing inspired deck layout but with modern, purposeful interiors. Dufour’s Grand Large series boats are more cruiser-centric and designed for comfort both on deck and below. The 41 and 50 are new to the Dufour fleet and every part of these boats has been designed with a focus on functionality. Take for instance the navigation table that can be used for passagemaking, then stowed away into a comfortable sofa when at anchor or while entertaining. For more information visit www.dufour-yachts.com. Hanse Yachts is another builder showing up with multiple models this fall. With on opportunity to step aboard a 34 to 49 footer you’ll be able to inspect nearly all of Hanse’s lineup. The Hanse fleet is designed by the famous Judel/Vrolijk & Co and they strive to build the fastest most comfortable boats in this size and class. Hanse is a builder that has a styling all their own but they let you customize the color of your yacht’s joinery, upholstery, exterior canvas and hull. 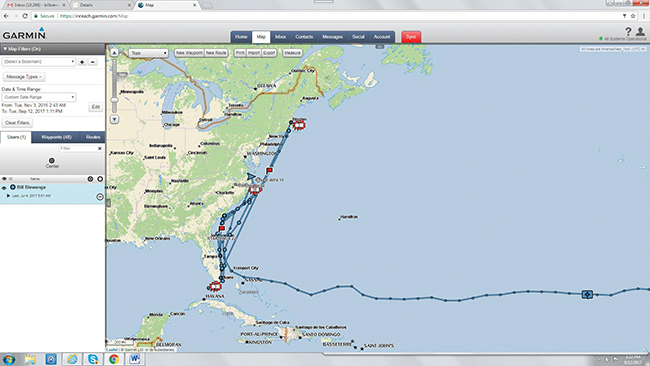 For more information visit us.hanseyachts.com. 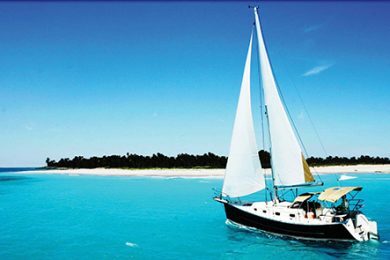 Island Packet is always a familiar boat show face and this year will be no different as they present models ranging from 36 to 46 feet. IP set the benchmark by building boats for serious cruising sailors and they are always looking to improve. 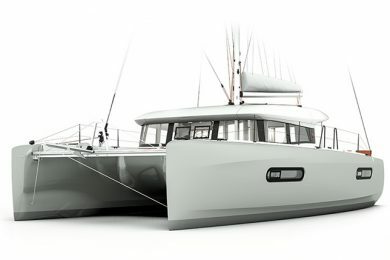 Good at incorporating owner input into their designs, the newest Island Packets are not only built to an extremely high standard, but they are comfortable at sea, more liveable than ever and have features that true cruisers are looking for; such as a Full Foil Keel® and cutter rig with Hoyt jib boom. For more information visit www.ipy.com. At last year’s Annapolis boat show the line to get on a Jeanneau was long, and for good reason; the boat builder puts on an impressive display and this years lineup looks to be much the same as they are set to showcase models from 39 to 50 feet. Of particular interest will be the new Sun Odyssey 469 and Sun Odyssey 41DS. Designed by Philippe Briand, the 469 has a pedigree that is uniquely Jeanneau with clean lines and a moderate freeboard. BWS had a chance to sail the 469 in February off Miami Beach (for the full review see the August 2013 issue of BWS) and can attest to the boat’s sailing ability and comfort in a big breeze. For more information visit www.jeanneau.com. This iconic boat builder will be showcasing their line of racers and cruisers this fall and there will be much to see. Launched just last year the J70 took off on a run that saw huge fleets showing up at key events such as Key West Race Week and Charleston Race Week. Not to be missed is the versatile J111. Equal parts racer, cruiser, daysailer and weekender, this 36-foot one-design beauty will have you winning races one weekend and cruising islands the next. For more information visit www.jboats.com. Hunter is back in the boat show mix with new models that range from 27 to 50 feet. This year, in celebration of their 40th anniversary, Hunter has debuted their sleek new 40-footer and it will be front and center at many shows. With hard chines, swim platform, hardtop and hand crafted interior, this new Hunter is a clear design departure for the boat builder and is worth a look. For a full review of the new Hunter 40 see the April issue of BWS. For more information visit www.marlow-hunter.com. What would a boat show be without a few Morris’ to give the docks that good ole’ Maine feeling? Morris has so much to choose from but their new M46 is a real looker. Designed in partnership with the venerable Sparkman & Stephens, the M46 is a unique design that can have you sailing to windward with the best of them or relaxing at anchor with your feet in the water from the boat’s innovative stern platform. 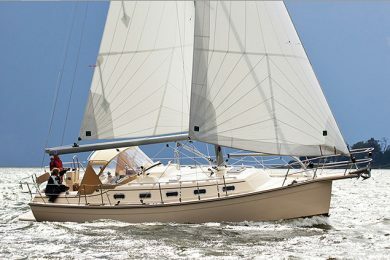 For more information visit www.morrisyachts.com. Moody’s new fleet, including the 41 and 45DS, have a distinctive look that will definitely catch your eye as you browse the docks this fall. The 45DS is a clear departure from Moody’s of the past and that is exactly what they went for with this new design. A plumb bow and stern, raised decksaloon with large expansive windows, and dual helms, gives this new Moody an ultra modern look that is sure to make a splash. For more information visit www.moodyboats.com. If you are looking for a luxury yacht that can take you anywhere your sailing heart desires, then this year’s lineup of Passports will be worth your time. The Passport Vista 545’s center cockpit, raised deck house and massive interior are going to tug at your sailing heartstrings, but it is the boat’s high tech composite hull and deck, along with Solent rigged headsails and an in-mast furling main that will have you wanting to get her out for a test sail. For more information visit passportyachts.com. The Rustler 36’s traditional styling and offshore capable design and build will be on display this fall and should not be overlooked. While the 36’s long, deep keel and stern hung rudder harken back to designs of the past, this boat is every bit a modern blue water cruiser that is bound to be surefooted in a blow and easy to sail shorthanded or by yourself. Add to that a beautiful interior that can be customized by the owner and you have boat that will truly meet your needs. 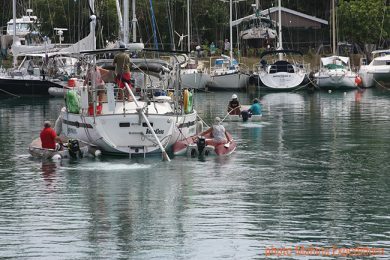 For more information visit www.rustleryachts.com. 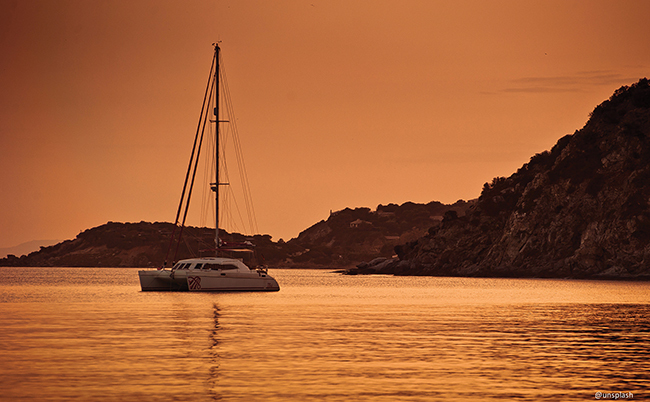 Planning on sailing in shallow water but looking for a boat that can take you over the horizon? You’ll definitely want to take a close look at Hake Yachts Seaward 26RK, 32RK and 46RK. The flagship of the fleet, the 46RK, is a true blue water boat with a powerful yet forgiving rig, comfortable living and sailing spaces and did I mention the seven foot keel that can be raised to give the boat a minimum draft of only two feet five inches? 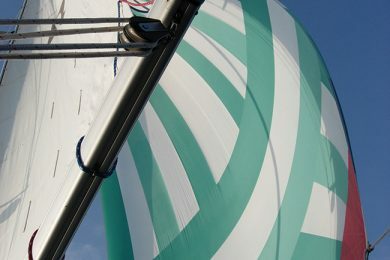 For more information visit www.seawardyachts.com. The S&S 30 is the newest incarnation of an old classic: Babe. Originally designed by S&S for the 1935 Miami to Nassau race, Babe was far ahead of her time and so deserved to be revived in beautiful fashion. Though the S&S 30’s initial intention was for a racer, the new 30 is also a pure pocket cruiser or daysailer. 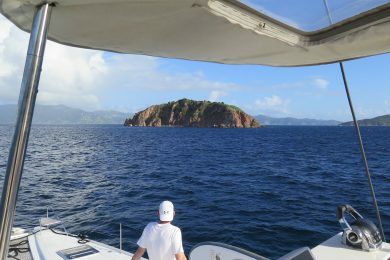 We got a chance to sail the boat in a fair breeze and it was an absolute pleasure to handle (for a full review see the March 2013 issue of BWS). For more information visit www.ss-30.com. Tartan is synonymous with quality sailboats and that is exactly what you will find from them at this year’s boat shows. With a line of boats ranging from the Fantail to the 5300, Tartan is always looking for innovation and progression in boat building and design. One of those progressions is Tartan’s unique ability to highly personalize their boats to a customer’s desires; and so it goes with the Tartan 4700. Filling the gap between the 4400 and 5300 the Tim Jackett designed 4700 has a raised deck saloon, three-cabin layout, a Solent style headsail rig with reacher and jib, and a carbon fiber pocketboom. For more information visit www.tartanyachts.com.